Over the course of the last couple weeks I have been exploring how you can bounce back from adversity by calibrating your internal compass and preparing for the uneven terrain of your life’s path. This is the final blog in the Bouncing Back from Major Life Changes series so I wanted to leave you with one powerful last thought and some ideas for building your resiliency. 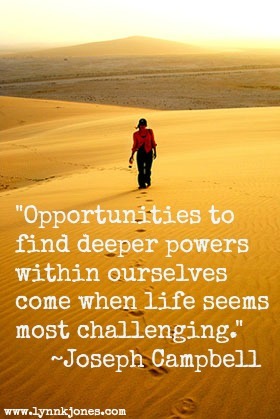 Life’s experiences provide fertile ground for learning. Asking yourself questions that invite introspection can open a door to new understanding and appreciation of who you are and what you stand for. Giving voice to your thoughts and feelings leads to insight and helps transform the meaning of a problem into something useful. Resilient people learn from life situations and do not succumb to punishing themselves because of decisions made in the past. Challenging times are an opportunity to find out more about who you are, what you stand for, and what you want to create in you life. If we have “kindsight,” challenges seem to arrive when we are ready to grow and learn. Taking the time to understand yourself better helps you to cultivate your truest desires. It is never too late to find out what your version of happiness looks like and to become wildly fulfilled in your life. Surround yourself with inspiring people and read for inspiration. Neuroscientist Dan Segal shares in Mindsight that when we have hope our brain is able to search for new possibilities even in the face of discouragement. What do you think? Are you willing to take the time to learn from your challenges and turn them into your greatest opportunities? Can you think of a time in your past where something challenging launched you into something totally gratifying? Please share with us what those times were. We would love to hear about it!! And as always if you can’t seem to make these necessary changes on your own or you just need some support on your journey, book your free introductory coaching session here. Wishing you abundant opportunities, greatness and fulfillment! P.S. Share this blog or the image below with someone who may need a little support and direction today! Dr. Lynn K. Jones is a Board Certified Coach and an Advanced Certified Personal and Executive Coach based in Santa Barbara, California and a sought after coach and consultant for organizations and individuals across the US. Her doctoral work completed at the Wurzweiler School of Social Work, Yeshiva University concerned organizational culture; she coaches, consults and trains organizations on what they need to do to create organizational cultures that are aligned with their vision and values using a process of Appreciative Inquiry. She coaches individuals on achieving their reflected best selves. A MSW@USC faculty member, Dr. Lynn K. Jones, MSW, DSW, CSWM, teaches Human Behavior and Social Environment and Leadership to social work students at the University of Southern California. I love the idea of “kindsight!” Hindsight is 20/20, but it doesn’t do us much good if we fail to learn from it. Major life changes aren’t always easy to deal with, but you’ve definitely given us some great tools to make it through! Glad you liked the post, Calla and thanks for making the connection to another kind of sight–hindsight! I have a feeling that you have been practicing Kindsight for a long time and that it has become a practice now. DrLynnKJones I am blessed to be in a wonderful career. That of jewelry designer specializing in wedding jewelry. This is a very happy place to be. I get to help, be kind, offer advice and solve problems. It is a blessing to be given the opportunity to live happily like this. Your post makes me appreciate the life and career I have. I love the idea of “kindsight”!! Asking ourselves positive questions that lead us in a helpful direction makes alot of sense; alot more sense than asking questions that don’t create learning. I like to focus my thinking on what is hopeful that has happened recently, as that helps me feel positive in the face of challenges. Great blog post! PatriciaSchwartz Fabulous point about asking questions that point you in the direction of hope. I like to say that when “we’re hopin’ were open” (and neuroscience confirms that! ), so that is a great practice. “Kindsight.” I like it! This morning I was really berating myself on some money choices. Then I thought about how I can’t expect myself to make better choices if I don’t practice making choices. Plus, what I was berating myself about was a blip on my life’s financial radar. Thank you for the blog post. AmyOrozco Fabulous reframe with kindsight, Amy. Good going! Miss the Mark? Try Again!